LVC’s women’s hockey team proved its worth this past weekend and swept King’s College off the table. Saturday and Sunday proved to be victorious for the team, all while honoring the team’s lone senior, forward Amy Templeman, on Sunday for senior day. On Saturday, Feb. 9, at King’s, LVC took advantage in the first and second period with goals from forwards Olivia Cindrich and Chloe Glass. While King’s scored two goals in the third period, LVC persisted and scored a power play goal from forward Darby Seymour and later from Glass again with less than a minute left. Goaltender and co-captain Jill Moffatt stopped 34 of 36 saves for a .933 save percentage and sealed a 4-2 victory. The next day, the momentum continued at Hersheypark Arena for senior day. LVC was able to hold off King’s for the entire game and score four goals in the process. Three goals came in the first period by forward Emma Stillwaggon, Glass and defenseman Madalyn Nelson, along with a fourth in the third period by forward Madison Humes. Moffatt stopped all 21 shots and secured her first shutout this season on Sunday. While the team worked toward victory over the weekend, it wasn’t over after Sunday’s game ended. For senior day, longtime player, defenseman and co-captain Amy Templeman, received honors from her family and teammates, who praised her for her unmatched leadership as a player and as a person on and off the ice. 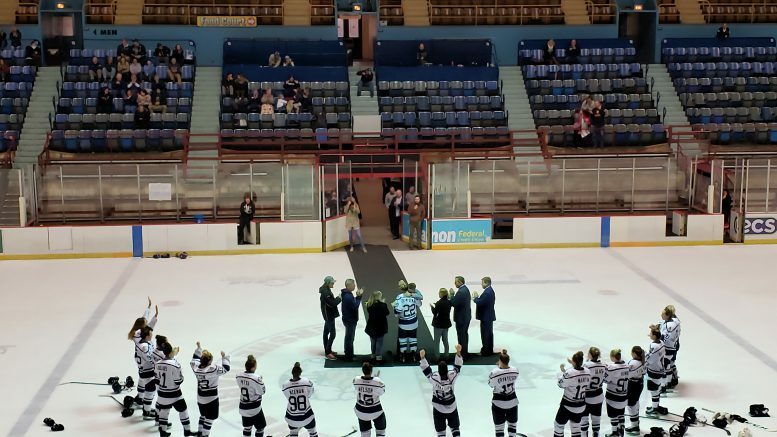 After the honors, Amy’s boyfriend, TJ Sneath, a senior forward on LVC’s men’s ice hockey team, came out and proposed to her in front of the crowd – she said yes! For their tireless efforts on the ice over the weekend, Glass and Moffatt were named MAC’s offensive and defensive players of the week on Monday, Feb. 11, respectively. The women’s hockey team will wrap up their 2018-19 season next weekend with a pair of games on Saturday, Feb. 16 and Sunday, Feb. 17 against SUNY Cortland in Cortland, NY. Both games can be streamed online at godutchmen.com.